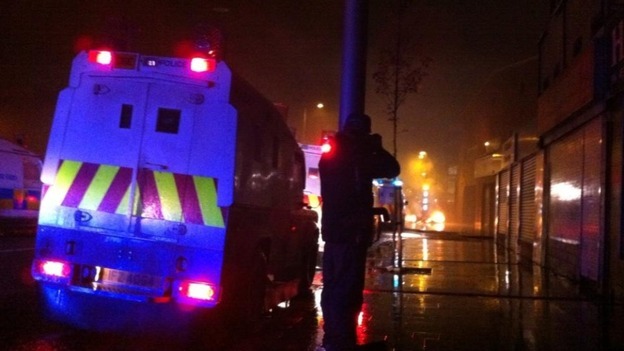 Petrol bombs, rocks and fireworks have been thrown at police in a fifth consecutive night of violence in Belfast. 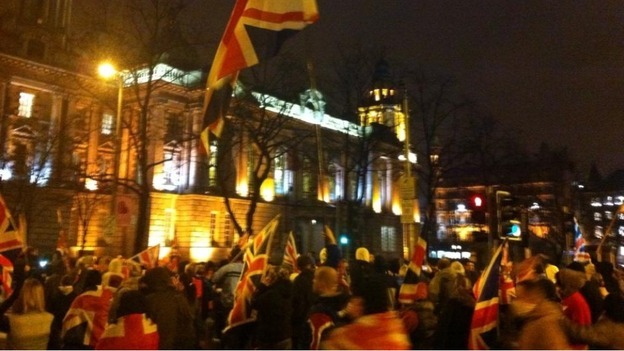 Protesters are demonstrating against the restricted use of the union flag at City Hall. 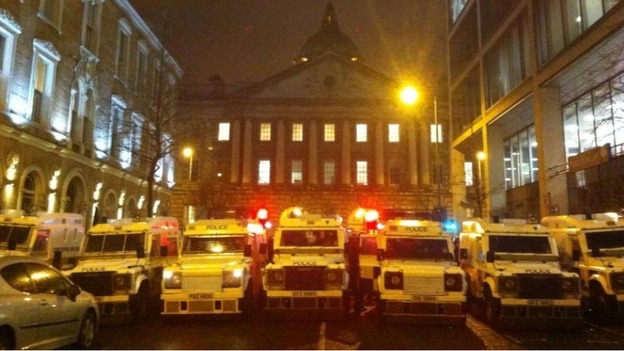 Officers have deployed water canon. 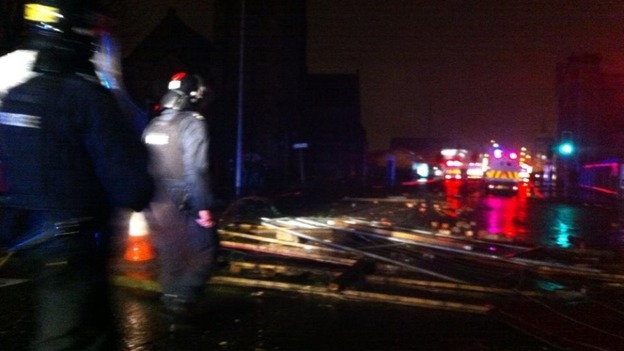 There has been a sustained barrage of missiles against police, some of which are big rocks. 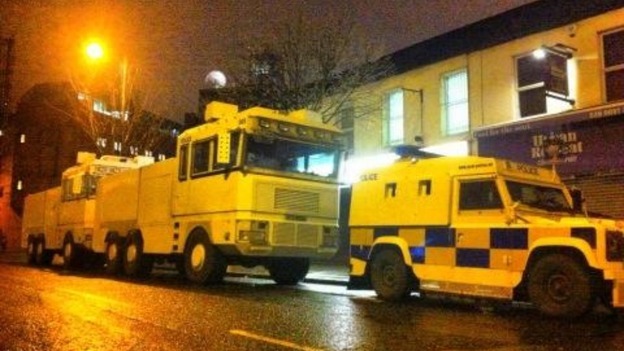 Water cannon has been used in retaliation. 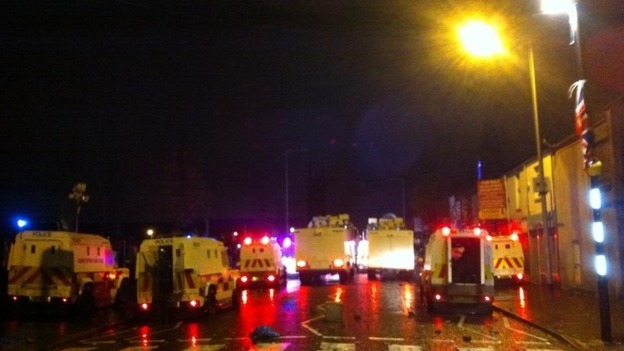 Fireworks and bottles are being thrown in east Belfast, near St. Matthews Church. Missiles appear to come from the nationalists behind the peace wall. 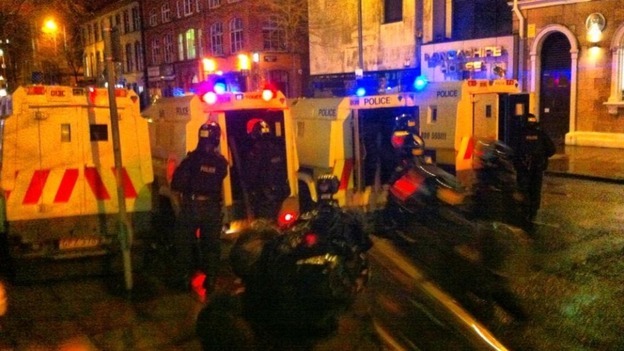 Police are using water cannon in bid to push the loyalists up Lower Newtownards Road away from nationalists. 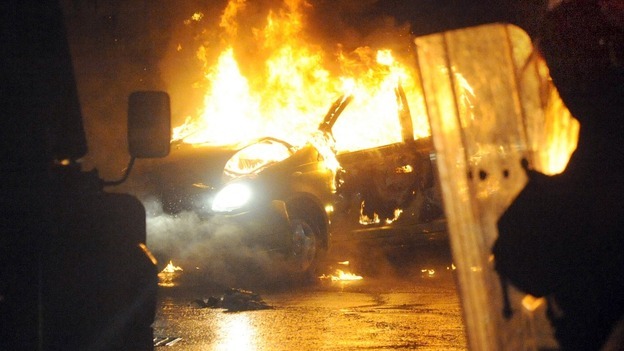 Senior members of the paramilitary Ulster Volunteer Force (UVF) are orchestrating loyalist street violence that has seen police come under attack in Belfast for the past four nights, Northern Ireland's Chief Constable has said. 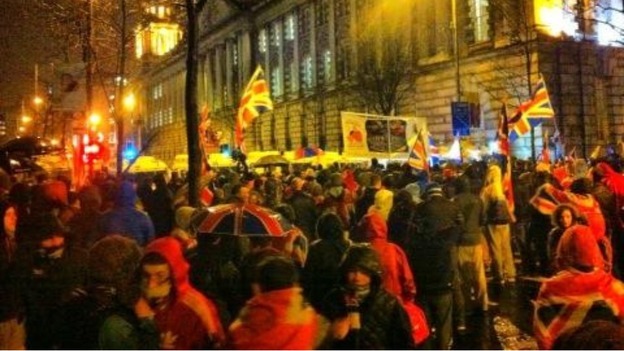 While the violence has erupted at ongoing Union flag protests in the east of the city, Matt Baggott today called for an end to all such demonstrations across the region. So far 62 police officers have been injured and 96 people arrested in violence which Mr Baggott described as "utterly unacceptable" and "being done for their own selfish motives." 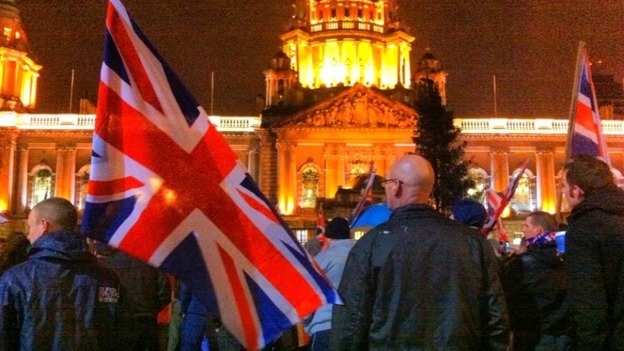 Loyalists pickets have been continuing since early December in response to a decision by Belfast City Council to limit the number of days the flag flies over City Hall. 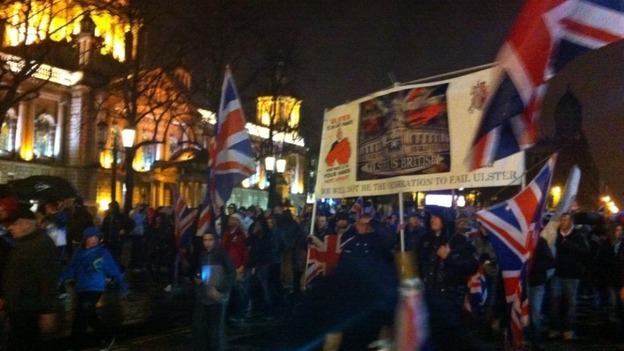 The death threats have come amid street violence that has broken out following loyalist protests over the flying of the Union flag from Belfast's city hall. Nationalist assembly member Patsy McGlone has hit out at "faceless fascists" after he became the latest politician in Northern Ireland to receive a death threat in the post. 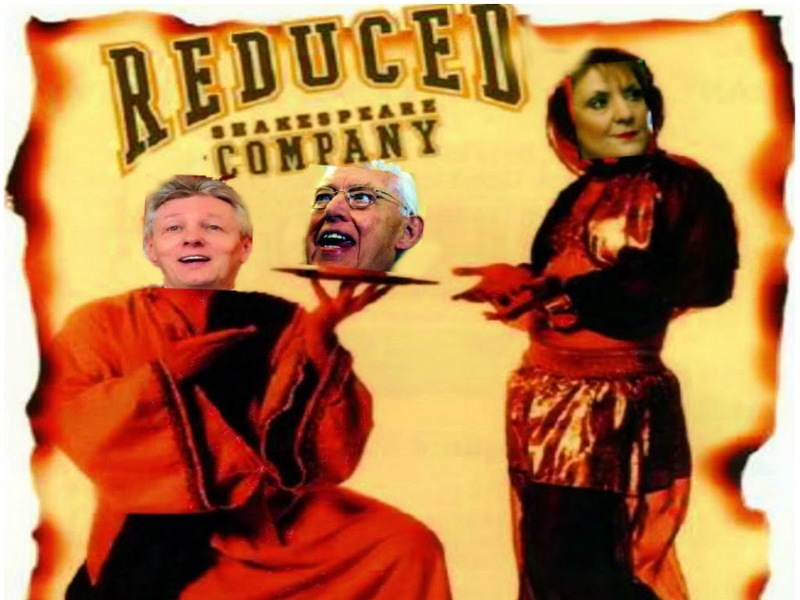 The senior SDLP figure confirmed he was sent a package with his name and picture that contained a bullet and sympathy card. 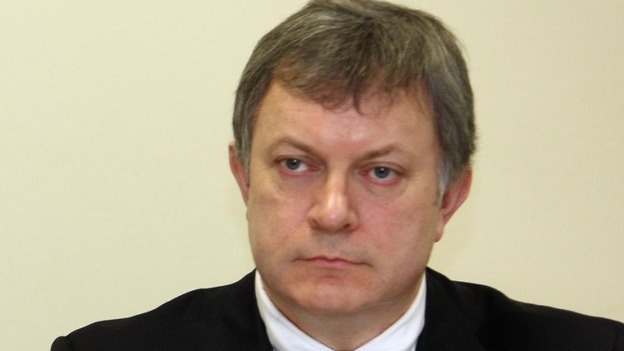 He paid tribute to the staff at the Royal Mail sorting office near Belfast, who intercepted the parcel, and the Police Service of Northern Ireland for their "professionalism and vigilance."